Facebook unveiled its Q3 earnings yesterday, beating all analyst estimates by posting $7.01 billion in revenue and $1.09 EPS, as compared to Wall Street estimates of a profit of 97 cents on sales of $6.92 billion, Re/Code reports. The social networking giant brought in over $5.7 billion in mobile advertising revenue, which alone is bigger than the company’s entire business in Q3 of 2015. Facebook also announced that it surpassed one billion “mobile only” monthly active users for the first time last quarter, suggesting that those billion-plus users actually never visited Facebook on any other device other their phone. And since advertisers are spending more and more on mobile advertising, Facebook is in a unique position to collect a lot of revenue from those ads. “We had another good quarter”, said company CEO Mark Zuckerberg. 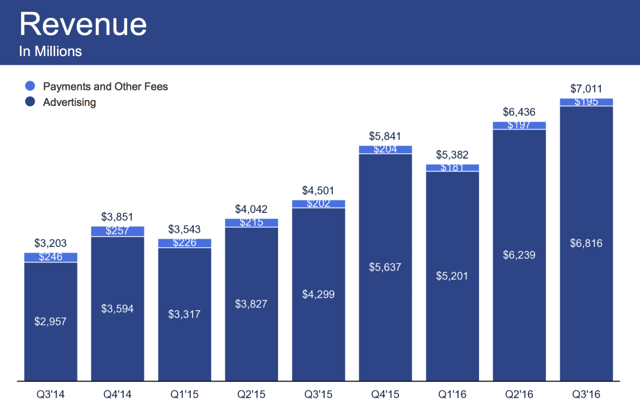 Mobile now makes up 84% of Facebook’s ad revenue, the same as last quarter and up from 78% in Q3 2015. The company make a total of $2.379 billion in profit, up an impressive 16% versus the $2.05 billion it raked in last quarter, and up a whopping 160% year over year. Expenditures were up slightly to $1.1 billion. Facebook is currently sitting on $26.14 billion in cash, equivalents, and securities.